File names are limited to 30.3 characters for OA Extension XML files (50.java for Java files). For performance reasons, object names (internal ID’s) are limited to 30 characters. Common abbreviations are acceptable to keep names as short as possible. Acceptable abbreviations can be instantly understood by a third party consultant. Object names in pages must be unique in the entire page. Most names follow Java naming convention (mixed case). The page name should convey the object it Presents. The region name should convey the object it Presents. The EO should be named for the objects stored in its underlying entity. 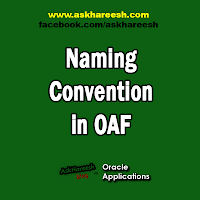 The AO name should convey the relationship between a parent and its child entities. The VO name should convey the nature of the query. The VL name should convey the relationship between the master and detail VOs. The AM name should convey the purpose of the UI module it services.